A New York model has been awarded $125,000 after her image was used in a 2013 New York City public health ad campaign falsely claiming that she’s HIV-positive. In 2011, model Avril Nolan posed for a magazine shoot on street fashion. The photographer later sold the photo to the stock image company Getty, and two years later, the New York State Division of Human Rights purchased the picture to use in an HIV ad campaign. “The ad also ran in an additional three print publications and three online publications,” according to NY Daily News. Nolan is not HIV-positive and she worried that the false declaration of her HIV-status could generate rumors and stigma against her. There’s a lot of negativity around it, and there’s a lot of associations that people jump to incorrectly about your lifestyle. People think… you’re easy, or you’re promiscuous…. It also brings up drug use and just all of these things that I did not want to be associated with and was very embarrassed to be associated with. The photographer apologized to Nolan, and the Division of Human Rights quickly pulled the ad offline and worked to ensure that it’d never be published again. But for Nolan, the damage was done. Nolan sued the Division of Human Rights for $1,000,000 over the “embarrassment, humiliation and fear she experienced,” but the court only awarded her 12.5 percent of what she originally asked. HIV stigma continues to permeate society, even in the LGBTQ community. 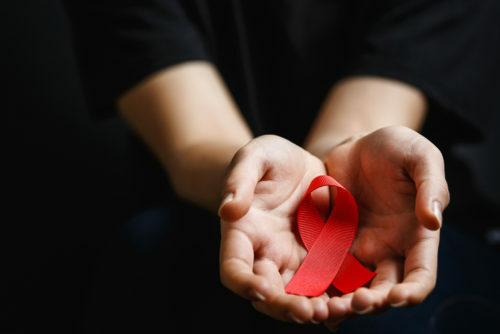 Over 50 percent of HIV-positive people have reportedly experienced discrimination over their status. A 2018 poll found that only 47 percent of gay men feel comfortable kissing an HIV-positive person. In April 2018, three unidentified plaintiffs successfully sued the drugstore chain CVS after it accidentally disclosed the HIV status of 6,000 customers in Ohio through a piece of postal mail.